Obituary – Plumer, Lucile (Warner) « Perry High School Alumni Association, Inc.
Class Secretary, Treasurer, Peroma Staff. Funeral will be at 2 p.m. Monday at the First United Methodist church for Lucile Plumer, 93, 1311 Seventh street, renown native resident. Mrs. Plumer died at 11:05 p.m. Thursday, July 28, 1994, at Stillwater Medical center. Rev. Tom Kirby, Perkins, formerly of Perry, will officiate. Burial will be at Grace Hill cemetery, under direction of Brown Funeral home. Mrs. Plumer was born Oct. 10, 1900, in Perry, Oklahoma Territory, the daughter of William and Edith Carrier Warner. 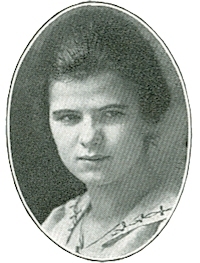 She attended rural school district 40 from 1907 through 1914, and graduated from Perry high school in 1918. 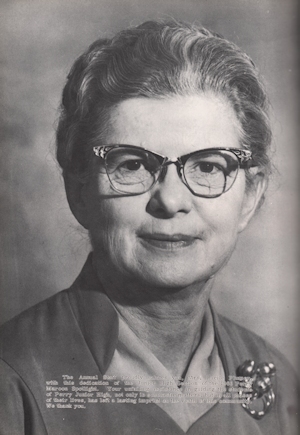 She earned her bachelor of science degree in education from Oklahoma State university in 1952. Mrs. Plumer taught school for three years before her marriage to Lawrence Hirschman on May 17, 1922. He died in 1959. Following the birth of her two daughters, Mrs. Plumer taught 10 years in rural consolidated school and 13 years at Perry junior high school. She retired in May, 1966. She and Louis Plumer were married December 25, 1965, in Perry. He preceded her in death in 1975. Mrs. Plumer’s activities and service includes being a member of Phi Kappa Phi, Delta Kappa Gamma of which she is a past president, National Retired Teacher’s association, Oklahoma Retired Teachers association, the United Methodist church for more than 70 years. served as treasurer of the United Methodist Women for 15 years, served three terms (6 years) as a member of the Board of Directors of the Cherokee Strip Historical society, Progress club of which she is past president, and the Grandparents club of which she was treasurer. She was awarded The Sunday Oklahoman Golden Thimble Award in January, 1994, with her sister, Mabel Eby. She is survived by her two daughters and son-in-law Evelyn Hill, Bartlesville, and Laural and Eugene Zavodny, Edmond; three grandchildren, Dr. George L. Hill and his wife, Linda, Douglas Zavodny and Madeline Zavodny; and four great-grandchildren, Christopher Hill, Zachary Hill, Allistair Hill and Verity Hill; two sisters, Mabel Eby and Jennie Colbert, both of Perry; and one brother, Edgar A. Warner, Springfield, MO. In addition to her parents and husbands, she was preceded in death by one brother, Ray Warner. Memorials may be made to the Cherokee Strip Historical society, Noble county chapter (museum). The Annual Staff proudly salutes Mrs. Lucile Plumer with this dedication of the Junior High Section of the 1966 Perry Maroon Spotlight. Her unfailing assistance in guiding the students of Perry Junior High not only in scholastic matters, but in all phases of their lives, has left a lasting imprint on the youth of this community. We thank her.